As one of the most important films in animated history, ‘The Little Mermaid’ has some weight to carry as the years progress. The film that rejuvenated the Disney brand and ringed in a new era of animation certainly should hold up as well as some of the other classics. It both does and doesn’t. Ariel and her friends are still a prime example of the musical/animation hybrid that now defines Disney. However, in a increasingly more savvy, post-Shrek and Pixar world, the tale of the red headed beauty might be a little too sweet. The heavily altered story of Hans Christian Anderson’s tragic mermaid is genius in its simple but fast-paced execution. There’s a lot of story to cover and so it immediately finds Ariel, the youngest, rebellious daughter of sea king Triton, longing for a life out of the water. Much like every other princess in the Disney slate, she falls for a guy, a prince of course, based on looks alone. Where the story gets interesting is that unlike the excruciatingly passive Snow White, Cinderella and Aurora, Ariel straight up saves her man from drowning in the first half hour of the movie. Ariel, love sick, naive and as motivated as a human teenager, driven away by her father who forbids her to interact with people, seeks help from the sea witch Ursula. One of Disney’s more entertaining villains, the divine and cunning Ursula makes a deal with Ariel. She gets three days as a human to kiss her man. If she fails, she belongs to the witch. And the currency for the deal happens to be the only thing Eric remembers of Ariel; her voice. Though the young mermaid definitely gets the short end of the stick, she signs a binding contract and the clumsy but adorable attempts to convince Eric of her love begin. What powers Ariel, and the movie as a whole, is the timeless identification with the teen experience. There’s the passionate but unachievable goal, the true love that just doesn’t notice you, the parental contraction that seems bitter and unfair. Ariel experiences it all which makes it easier to forgive her for her rash and naive decisions. Thanks to sheer Disney magic, it’s hard not to buy into the first glance true love deal that suggests Eric and Ariel belong together. Especially because he’s a dog saving stud and she’s a model figured go-getter. Their romantic one day getaway is plain cute, as is the well known boat trip. Less attractive is that Eric fails to truly fall for Ariel, without knowing she’s the girl that saved him, and that she doesn’t seem to mind giving up her life, family and loyal friends for a guy. But that might just be too much of real world talk for a movie that features a reggae crab and merfolk. Obviously the decisive factor of the movie is its marvelous soundtrack. Without the brilliant touch of Howard Ashman and Alan Menken, the ambitious story might’ve panned out as another The Black Cauldron. Nowadays Disney songs are as beloved as they are hated. And the movie’s songs lack any true critic defying, universally liked showstoppers like The Jungle Book or The Lion King. Yet, ‘Under the Sea’ is a close as it can get. Without halting the story, the comedic sidekick Sebastian the Crab tries to convince Ariel how infinitely better life actually is in the ocean. Even more so, the most perfect example of the ‘I want’ protagonist moment is Ariel’s ballad ‘Part of Your World’. It’s bittersweet and tragic, soothing as it is bombastic, but most of all it’s character defying. 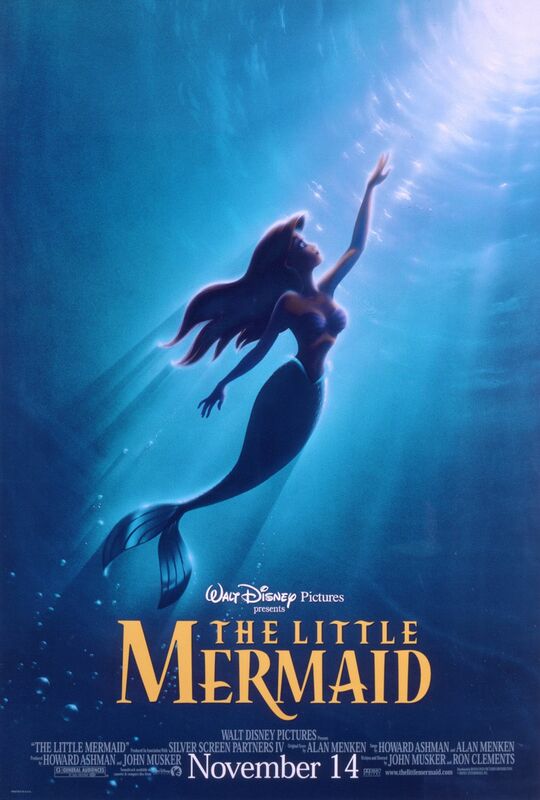 Feeling like an outsider in a pretty privileged position (she is a princess after all) Ariel longs for the life she glorifies and doesn’t fully understand. The reprise following Eric’s rescue that sees her leaning on a rock while waves crash into her while she hits a high note is a dramatic high point if Disney ever knew one. The film skews to a younger audience and that is its biggest hurdle. The film doesn’t ever go really dark or serious, the way Snow White does with the murder attempts or Bambi with the harsh life lessons. This is the embodiment of the newer, commonly known Disney incentive. Blind optimism and an empowering, undeniable faith in a true love that will concur all. Ariel’s resolution is getting what she wanted, without much proof she learned something along the way. Ursula’s intentions or motivations are never truly explained but despite legally obtaining ultimate power, she’s assumed evil and thus must meet her maker. The only character arc worth visiting is that of Triton himself. He initially rules with an iron fist which culminates in the film’s only devastating scene. One that will resonate with any kid with the idea of private belongings being taken away by parents. Triton, like many parents often do, wonders if maybe he was too harsh on his daughter, unintentionally pushing her away into evil’s arms. In the end, he, like so many parents would, sacrifices himself (and, seemingly unimportant, his entire kingdom) to save his child. But this plot is mostly put aside for the sake of dancing fishes and an unnecessary step out of the story which features Sebastian being chased by a cartoonish chef under a popular classical song, echoing a Tom & Jerry skit more than it probably should. It’s easy to put ‘The Little Mermaid’ in the girly princess box because in its essence it doesn’t try to be anything other than that. It shines in its bright, lush colors and entertaining musical numbers, while also relishing in some deliciously agonizing storytelling ploys that will hold your attention. In order to usher in a decade of marvelous animation, Disney went back to the drawing board, and it found the inspiring tale of a girl who dared to dream, without reservations, beyond reason and logic, but with the kind of optimism that should be a part of any kid’s world.